Yesterday I had the chance to visit the latest Karl Fritsch exhibition at Gallery Funaki: Die Allgauer Ringmaschine. The show was designed as a one-week-only event as part of Melbourne Spring Fashion Week (last week), but has been extended another week due to popular demand. It's easy to see why, looking at Fritsch's chunky new aluminium block rings carved and filed to a rough finish and set with abandon with precious gems. 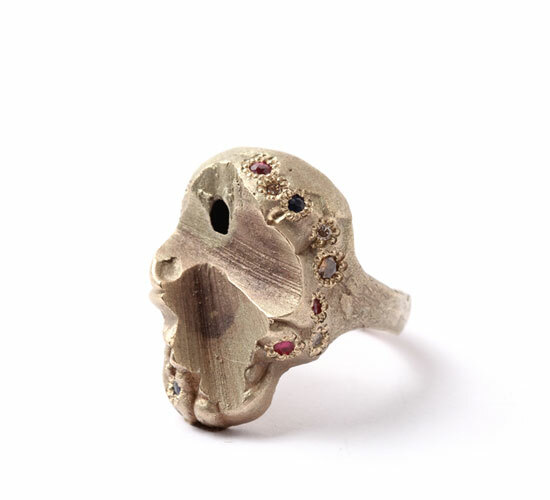 Other works have diamonds nailed to ring shanks, or precious gems grain set into carved and altered traditional ring forms, and the work is nailed and stapled industrially, almost brutally, into timber two-by-fours in the front corner of the gallery. Installation photos can be seen on Gallery Funaki's Facebook page. Altogether, the show is stunning, challenging, and incredibly beautiful in a decidedly non-gallery (but very Karl Fritsch) way. And the new artist monograph, available at the gallery, is another stunner. Go and see it before it ends on Saturday! Arbor Jewels is launching a new website!